For over three decades Dr. Vogel has studied the human complement system with a particular emphasis on its potential role in cancer. He has used cobra venom factor (CVF), a structural and functional analog of the activated form of complement component C3, as a molecular tool to study the structure/function of human C3. Over the last several years he and his colleagues have succeeded in generating a derivative of human C3 with CVF-like functions, including the temporary depletion of complement activity in serum, both in vitro and in vivo. The human C3 derivative, termed "humanized CVF" (hCVF), represents a novel experimental therapeutic reagent for complement depletion, with possible clinical applications in many diseases where complement is involved in the pathogenesis of the disease process. Multiple pre-clinical studies have shown the efficacy of hCVF, with no adverse effects. hCVF has been shown to have a dramatic survival benefit in a mouse model of lymphoma treated with a monoclonal anti-lymphoma antibody. hCVF has also been shown to be effective in multiple non-cancer diseases, including age-related macular degeneration (AMD), myasthenia gravis, myocardial infarction reperfusion injury, arthritis, paroxysmal nocturnal hemoglobinuria (PNH), and others. Treatment with hCVF also reduces the generation of anti-Factor VIII antibodies in hemophilia. Dr. Vogel's laboratory continues to investigate the efficacy of complement depletion with hCVF in multiple additional models of disease. He and his colleagues are also trying to develop novel forms of hCVF exhibiting different pharmacokinetic properties. 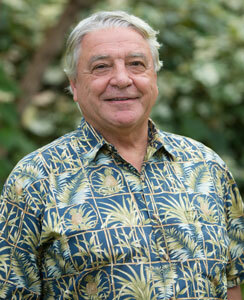 Dr. Vogel is Principal Investigator of consecutive U56 and U54 Grants since 2003 as part of NCI's Minority Institution/Cancer Center Partnership program (MI/CCP), renamed Comprehensive Partnerships to Advance Cancer Health Equity (CPACHE) between the University of Hawaii Cancer Center (UHCC) and the University of Guam (UOG). The current $5.5 million U54 grant is awarded through 2020. The partnership with UOG is a long-term partnership addressing cancer health disparities in Pacific Islanders in Hawaii, Guam, and the U.S.-associated Pacific territories. It provides funding for joint research projects, training programs, and regionally important outreach. Vogel C-W, Fritzinger DC. (2017). Cobra Venom Factor: The Unique Component of Cobra Venom that Activates the Complement System. In: Handbook of Toxinology. Snake Venoms. (P. Gopalakrishnakone, H. Inagaki, A.K. Mukherjee, C.-W. Vogel, Eds. ), pp. 345-404. Springer Science+Business Media, Dordrecht, The Netherlands (2017). Cabrera-Fuentes HA, Aragones J, Bernhagen J, Boening A, Boisvert WA, Bøtker HE, Bulluck H, Cook S, Di Lisa F, Engel FB, Engelmann B, Ferrazzi F, Ferdinandy P, Fong A, Fleming I, Gnaiger E, Hernández-Reséndiz S, Kalkhoran SB, Kim MH, Lecour S, Liehn EA, Marber MS, Mayr M, Miura T, Ong SB, Peter K, Sedding D, Singh MK, Suleiman MS, Schnittler HJ, Schulz R, Shim W, Tello D, Vogel C-W, Walker M, Li QO, Yellon DM, Hausenloy DJ, Preissner KT. From Basic Mechanisms to Clinical Applications in Heart Protection, New Players in Cardiovascular Diseases and Cardiac Theranostics: Meeting Report from the Third International Symposium on "New Frontiers in Cardiovascular Research". Basic Res Cardiol, 111 (2016), 69. PMID:27743118. Vogel C-W, Fritzinger DC, Gorsuch WB, Stahl GL. (2015). Complement Depletion with Humanised Cobra Venom Factor: Efficacy in Preclinical Models of Vascular Diseases. Thromb Haemost, 113, 548-552. PMID: 25032089. Vogel C-W, Fritzinger DC. (2014). Human Complement C3 Derivatives with Cobra Venom Factor-Like Function. U.S. Patent No. 8,632,780. Robinett HR, Harbach H, Vogel C-W. (2014). Regional Cooperation in Addressing Cancer Health Disparities: NCI's Geographic Management Program (GMaP) and Biospecimen Management Program (BMaP) in Western States, Hawaii, and US Pacific Territories. Hawaii J Med Public Health, 73, 37-38. PMID: 24470986. 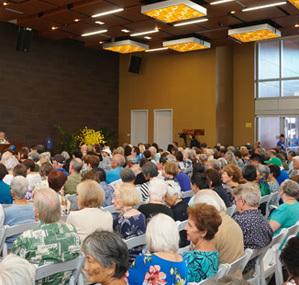 "University of Guam/University of Hawaii Cancer Center Partnership"